The Grand Majestic Dinner Theater is a great theater offering multiple high energy, rousing dinner shows of song, dance and comedy for the whole family. America’s Hit Parade – hit songs of the 50’s thru 80’s. Soul of Motown – the signature sound that became an instant world hit. 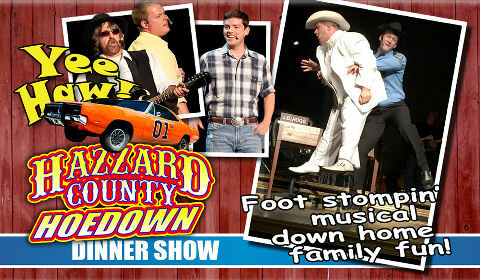 Hazzard County Hoedown – characters and antics from the famous TV show. The theater moved in 2014, so note the new location on Parkway – if it’s been a few years since you were there, don’t be surprised at the change of location. The new venue offers greatly improved facilities. The theater offers a large auditorium and foyer, plenty of guest amenities, and lots of parking – a crucial thing in the bustling town of Pigeon Forge. Dinner is served about an hour before the show starts. And here are the shows currently playing. 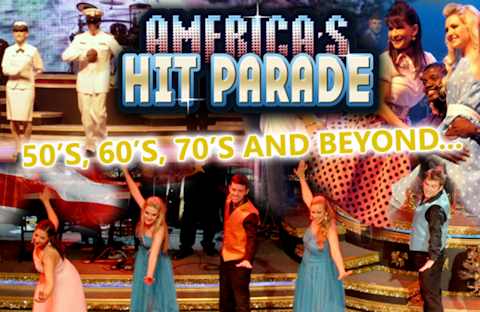 Relive your favorite hits and listen to songs you thought were gone forever in America’s Hit Parade at the Grand Majestic Dinner Theater in Pigeon Forge. It’s a high energy, rousing show of singing and dancing that brings alive the hit music of the Fifties, Sixties, Seventies, and even some of the Eighties. The spectacular costumes and settings combine with sensational, attention-getting performances from the extremely talented cast and live band of the show. The soaring choruses, outstanding blended harmonies and note-perfect renditions will set you back in time and get your feet tapping. The show is filled with reminiscence and special meaning – it’s okay to get nostalgic, and don’t be surprised if you and the rest of the audience start singing along with the performers. The show is designed for all ages, so it’s safe to bring the kids and let them marvel at the crazy way Mom and Dad used to dance! 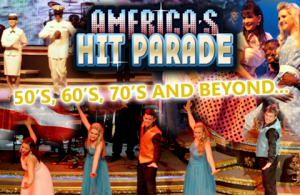 America’s Hit Parade also reserves a special place in its heart for the men and women of the armed forces, and offers a Military Tribute that will move and inspire you. As with most things in the Smoky Mountains, the performers and staff of the show go out of their way to meet and greet their guests, often with an after-show mingling to meet the performers. – -A TripAdvisor “#1 Show in the Smokies” award winner. Motown was unique in pop music, an unmistakable sound that gripped the music scene in the 1960’s, unique for its time and never duplicated since. The music was immediately catchy, with infectious, driving beats and soulful melodies that created a massive wave of giant hits across America and the world. Now you can live that Motown music again, performed live by the amazing singers of Soul of Motown, a gripping, high energy show that will get you tapping your feet, singing along, and dancing in the aisles! Parents will be amazed at how many songs they know the words to, and had forgotten. Kids will be captured on hearing this music they may never have heard before. 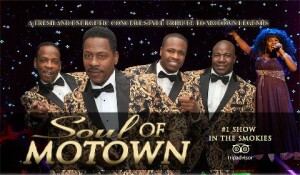 Soul of Motown creates the music of The Drifters, The Platters, Sam Cooke, Smokey Robinson, The Jackson Five, Marvin Gaye, Stevie Wonder, The Four Tops, The Temptations, The Impressions, The O’Jays, Earth Wind and Fire, and many more. The show also features the Ladies of Soul – names such as Aretha Franklin, Diana Ross and the Supremes, and Gladys Knight & The Pips. 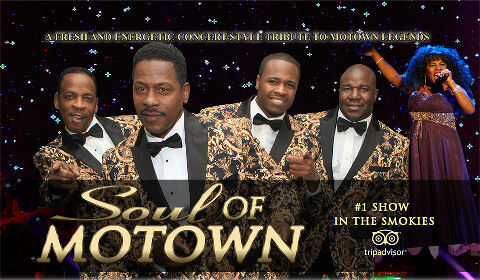 The Soul of Motown performers are highly accomplished entertainers with tremendous stage presence and audience interaction. This show will enthrall the whole family from young to old. As you leave the theater floating on a cloud of music that won’t let go, you’ll see why so many people plan their trips to Pigeon Forge to include a return visit to Soul of Motown. If you loved the long-running Dukes of Hazzard TV show, you’ll love this stage recreation of the characters and antics that made the show a legend. Relive some memories and introduce your kids to some new ones. Kids immediately relate to the comedy and antics of the Hazzard County characters. The performers are extremely accomplished, and bring all the characters to life. Expect intense discussions in your family after the show about which particular character stole the show! See again the Duke boys, Bo and Luke, Boss Hogg, Roscoe, Uncle Jesse, Flash, and special guests that turn up during the show, in a foot-tapping, rousing musical with comedy, dance and clean family fun. The country music includes modern hits and some great impersonations and covers that allow the talented performers to excel – more of that “stealing the show” argument again! If you liked the TV show, you will LOVE this stage performance of Hazzard County Hoe Down!